Bus tour to the canyon and the Fern Grotto. Bus tour to the canyon and the Fern Grotto. OK.
we enjoyed this tour. But it was a bit too long. 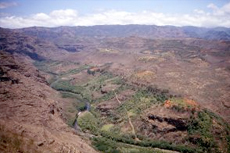 This was a combination of the Waimea canyon & Wailua river. Thought the bus was a bit over crowded, but comfortable. The views were spectacular. Well worth the drive to see this. Well worth the drive to see this. A wonder of Mother Nature. Interesting to see all the Tsunami warning sirens and escape routes along the way. It would be terrifying to hear those sirens I am sure. A long bus trip and the bus had to stop several times due to overheating. A long bus trip and the bus had to stop several times due to overheating. The view from the top of the canyon is breath taking. Very much like Grand Canyon. This gentlemen was a native Polynesian Hawaiian and the information he informed the tour group was priceless, We all had a great time and the price we paid for the tour to Waimea Canyon was fantastic. This was only island where the dirt was not black but a reddish color. Breathtaking view, can&apos;t be missed. Breathtaking view, can&apos;t be missed. Was part of the Best of Kauai tour. The fern Grotto was also a sight to see and we enjoyed the boat ride out to the grotto too. We did the "Journey to Waimea Canyon". It turned out to be a long day on the bus, driving to and from Waimea Canyon. It turned out to be a long day on the bus, driving to and from Waimea Canyon. Stopped on the way at different areas, which were interesting. The Canyon was beautiful. We rented a car and drove to Waimea Canyon on our own. We rented a car and drove to Waimea Canyon on our own. A gorgeous place to visit! in best of Kauai excursion. in best of Kauai excursion. beautiful place to see, but I wish I had booked separately so more time could have been spend there. to beautiful for 25 minutes. Larry, the driver of the Roberts Hawaii bus was very informative and gave wonderful history of not only Waimea, but the history of the island and the peoples who have settled it. Worth every penny! A long ride for a rather short visit to the canyon but the view was great. A long ride for a rather short visit to the canyon but the view was great. A very windy road so be prepared if you have a tendency to get car sick. Grand Canyonesque and breath taking. It seemed like a long, long ride to see some less than spectacular views of the canyon. It seemed like a long, long ride to see some less than spectacular views of the canyon. The ride to get there, however, was really great. The Canyon views were great, especially the waterfall. Just like the Grand Canyon! Did Fern Grotto and Waimea Canyon. Really interesting tour of the island and the canyon was beautiful. Really interesting tour of the island and the canyon was beautiful. Sam, our guide was great! The waimea canyon is worth seeing.